A visual 3D retinal model could facilitate the process of disease diagnosis. We have studied 3D retinal surface reconstruction by using the affine camera due to the narrow field-of-view and the small depth variation in each field. We have proposed the affine bundle adjustment algorithm, which refines visual reconstruction and camera parameters simultaneously. Moreover, we have developed a new 3D reconstruction algorithm that incorporates the retina’s geometric constraint and the radial distortion removal into the optimization process of bundle adjustment to further improve the quality of 3D retinal curvature estimation. 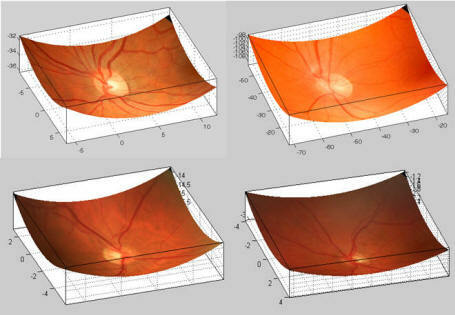 Examples of 3D retinal curvature estimation. T. Chanwimaluang and G. Fan, “Constrained Affine Bundle Adjustment for 3D Retinal Surface Reconstruction”, in the IEEE International Workshop on Beyond Multiview Geometry: Robust Estimation and Organization of Shapes from Multiple Cues (in conjunction with CVPR07), Minneapolis, Minnesota, June 2007. T. Chanwimaluang and G. Fan, “Affine Camera for 3D Retinal Surface Reconstruction”, in Proc. 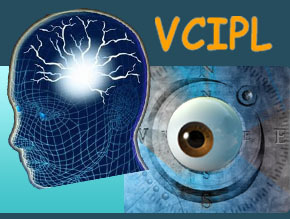 International Symposium on Visual Computing, Lake Tahoe, NV, Nov. 11-13, 2006, also in LNCS, Vol. 4292, Editors: G. Bebis, Springer, 2006.